Indiasudar Student Baby.M completed her B.SC chemistry with 75% -First Class. Now she got admission to pursue M.Sc Chemistry in Govt Arts college,Rasipuram. The fee is very very less. She told her parents will pay. Indiasudar will guide and assist her to write GATE/CSIR/NET exam. Congratulations and wishes to Ms.BABY. Though her marks in plus two is less, we gave her support and motivation to do UG degree and now she proved herself. We are extend one teacher support in Government Middle School at Ozhalure Village, Chengalpattu, Tamil Nadu for this academic year also. Beneficiaries: 1st std to 4 std students. About on site: 147 students are studying in this school. 3 govt teachers are working including HM. Our sincere thanks to sify associates for supporting this year also. Indiasudar has paid college fee (PARTIAL SUPPORT) to the following students with the help of your consistent support. Thanks to each one of you for elevating the students. Thanks to our members Mr. Arumuga Perumal and Ramkumar for coordinating the projects. Please refer the attached project reports for further details. 2 P. Harikrishnan 2nd year – Diploma In Mechanical Engineering 3500 Father R. Pitchai (weaver) – 2250/, P. Saraswathi labour(600 per month) having one sister studying 9th std and staying in rental house. 3 S. Arunagiri 2nd year-B.Com 4500 This student had completed +2 last year and there is no financial position and could not able to join college. Her father is working in an acid company as coolie. Mother is a patient and could not walk and her elder sister is working as a house maid and her younger brother is now studying in ITI. 4 N.Karthika 3nd year- Diploma in Garment Technology 4500 Father expired. Mother is working in a Transport company. Elder sister is studying M.Sc. Total monthly income: Rs.4000. They are living in a rental house. 5 R.Vijayakrishnan ba B.Ed –One year course 5000 Father met an accident and at present he is not able to go for any job. Mother is able to earn 2500 Rs. Besides she has to take care of my elder sister’s kid. They are staying in a rental house. We have conducted the Career Guidance program at Madurai in Sengunthur Uravinmurai High School and Vivekananda Higher secondary school on last Saturday(9-Jul-2011). Totally 300(115 +185) students benefited from the program. Thanks to IS member M.Raja for conducting the wonderful Career Guidance programs. 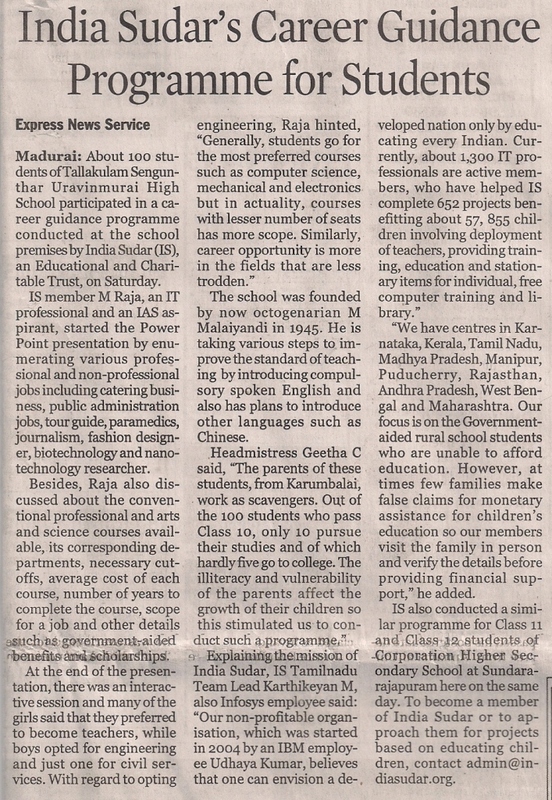 Article about the Career Guidance program was published in the Indian Express paper on Sunday and attached the same. Thanks to IS member Manikandan for coordinate with Indian Express to publish the article. Special Thanks Uma Rani (Hope Trust) and Narendran T for organizing the programs at two schools. Please find the attached project report for the same.